The invitations to our annual Fourth of July barbecue have gone out (did you get yours? ), and there are a couple of people who didn’t make the list this year. Don’t get us wrong: It’s not that we dislike these individuals. We just think that their time would be better served tending to more important things, like therapy, diversity training and anger-management class. But he didn’t. He had the audacity to go on Anderson Cooper’s CNN show and duck and dodge questions about all of the incidents that suggest he harbors a severe dislike for black and Hispanic people, and worse, that he willfully acts on his bigotry. During the interview, Donald ran his mouth about everything under the sun, like how Magic Johnson doesn’t do enough for the African-American community and how Magic should be ashamed of himself for contracting HIV. Since Donald doesn’t want to atone for his actions and doesn’t seem interested in getting help—in the form of therapy, perhaps—then it’s probably best that he keep a healthy distance from the mouthwatering hot dogs, baby back ribs and juicy coleslaw we’ll be dishing up at the barbecue come Independence Day. As old country folks would say, it seems like Justin Bieber always got something goin’. In January, Justin was arrested for a DUI (that’s offense No. 1) while drag racing (offense No. 2) on an expired license (offense No. 3); and cops added a “resisting arrest” charge to that plate because Justin allegedly cursed the cops out while they tried to detain him. It’s an epic fail times four. And then video surfaced of a young Justin making a not-so-funny joke using the n-word. The discovery was a huge blow to his image, since he’s been morphing into the Vanilla Ice of this generation and cozying up to some of the biggest names in hip-hop. We’ll give Usher and Jaden Smith some ham hocks and chitlins to take back to Justin. We’re suggesting that he do something super low-key this year. Ghana’s World Cup team—the Black Stars—had a lot on their minds going into their match against Portugal. Two of their best players had just gotten kicked off the team hours before the game, reportedly because of issues relating to how there were outstanding salaries and fees owed to some of the players. The word is that the president of Ghana—Mr. John Dramani Mahama himself—had to get on the phone and speak to the players to assuage their concerns, and then flew millions of dollars into Brazil in order to settle the debts. It’s not fair that some World Cup players have to be subjected to this sort of tension and instability off the field. And for that reason, we don’t want to see any high-ranking Ghanaian politicians at the barbecue. The players are, of course, welcome, especially cutie pies Asamoah Gyan and Kevin-Prince Boateng. But only if they teach us how to do their victory dance. There’s that supervisor down in Memphis, Tenn., who thinks it’s still the antebellum South. He told his African-American workers that they ought to think like a white man, and that they’re not allowed to use a water fountain because it’s for “white people only.” He probably couldn't participate in the limbo contest no way. 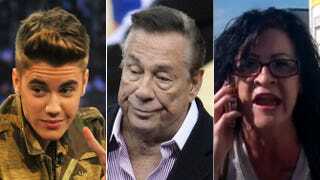 Shelly Sterling, Donald Sterling’s wife, can stay home, too. This isn’t a case of guilty by association. Shelly and Donald were named in a discrimination lawsuit filed by tenants who accused the Sterlings of discriminating against black and Hispanic people who lived, or were looking to rent units, in the buildings they owned. Unless Shelly can prove that Donald is a Dr. Jekyll and Mr. Hyde, we have to assume that she was well-aware of Donald’s character. Even if we did give Shelly the benefit of the doubt, it seems like she turned her head to far too many of Donald’s racist shenanigans. At best, she implicitly condoned and benefited from his behavior as his wife. So no, Shelly can’t “boogie-woogie-woogie” with us when “The Electric Slide” comes on. Cliven Bundy, a Nevada rancher, is full of so much hypocrisy that it’s hard to take his criticism of the federal government seriously. He wants Washington to leave Western ranchers alone but is basically defaulting on a government loan of sorts: He refused to pay for the federal land he is using to graze his cattle. When you consider all that, it’s almost laughable that he opined that black Americans were better off during slavery, when they had strong family ties and weren’t on government subsidies. He might try to bring his cattle to the cookout park for free grazing, and we’re not having that. Janelle Ambrosia, the upstate New York woman who called a black man the n-word more times than I can count during an argument in a parking lot, needs some serious help. The good news is that Janelle sounds like she knows this, because she said as much after seeing herself in action. The man on the receiving end of Janelle’s four-minute tongue lashing filmed the incident and posted the video on YouTube. In a radio interview after the incident, Janelle said that she is not racist and that she has a black cousin. That cousin ought to have a few words with her. The n-word came flying out of her mouth far too many times, and with way too much vitriol, for this to be a one-time incident. It would probably be best for V. Stiviano—Donald Sterling’s “female friend”—not to show her face, either, even if it is hidden underneath that infamous visor of hers. At first it just looked like V. was a young, wide-eyed woman on the come-up who caught the eye of a millionaire and was trying to cash in on her luck. If she got paid thousands of dollars to leak the tape to TMZ, it wouldn’t be fair to knock this woman’s hustle. But then she appeared far too cavalier during her interview with Barbara Walters. She seemed to be basking in all of the attention and sounded disingenuous when she denied leaking the tapes to TMZ and claimed that her friend leaked the tapes instead. Then she sounded outright delusional when she said that she wasn't Donald’s girlfriend but his “silly rabbit,” and that she believed he was not a racist. V., dear, we can’t promise that you won’t see 20-inch rims at this event. So go on and sit this one out. It doesn’t matter that Paula Deen hosted Oprah and Gayle for a girls’ weekend and taught them how to catch catfish at her Savannah, Ga., estate, or that her jerk shrimp kebabs are so yummy that they make grown men weep. She’s not invited to the barbecue, either. Who can forget all of the disturbing things she revealed during a court deposition: how she uses the n-word every now and then, and how she joked about hiring an all-black wait staff for her son’s wedding. Her apology was also disturbing. Paula insisted that she and her family members are not the kind of people the press is making them out to be, and that they have no tolerance for bigotry. Paula—like many people who claim that they are not racist after saying racist things—should understand that this behavior is probably indicative of some sort of deep-seated bigotry. If she can’t grasp that, then I have no reason to believe that she’ll do the work needed to address those prejudices. And so instead of attending our barbecue, Paula would likely benefit from an intensive race-relations seminar. She can, however, cater a dish or two. Perhaps send over a few pans of her baked chocolate custard or her red-velvet bread pudding. We will not turn away good food. No, ma’am. 10. Anyone who planned or attended the “dress black” party thrown by the Tau Kappa Epsilon chapter at Arizona State University. The Tau Kappa Epsilon chapter at Arizona State University is banned from the school and also banned from our July Fourth gathering. It’s mind-boggling as to why no one thought to speak up during the planning phase of their party to celebrate Martin Luther King Jr. Day and tell their peers that the “dress black” theme was probably not a good idea. But people do make mistakes when they are trying to be funny. For compassion’s sake, let’s just say that the chapter was not privy to the several dozen people across the nation who had their derrieres handed to them for wearing culturally insensitive costumes. The TKE chapter still can’t come watch fireworks with us because apparently this isn’t their first rodeo with regard to race. The chapter was already on probation for getting into a fight with an African-American male student from a rival fraternity. They beat him up, and he suffered a broken jaw and concussion. 11. The person who threw the banana at Dani Alves. Someone in the stadium threw a banana at Barcelona soccer player Dani Alves, a Brazilian, during a game in April. Alves responded in such a suave way. He picked up the banana, peeled it and ate it. On one hand, this person deserves a gift basket for bringing Dani to everyone’s attention: He’s not too bad on the eyes. On the other hand, enough is enough with this racist act, where chocolate-complexioned soccer players all over the world are taunted with monkey sounds and are having bananas thrown at them by disgusting individuals. At the upcoming barbecue, bananas are for banana puddings, the ripe ones for plaintains. And only couth people are allowed. Diana Ozemebhoya Eromosele is a staff writer at The Root and the founder and executive producer of Lectures to Beats, a Web series that features expert advice for TV and film's most complex characters. Follow Lectures to Beats on Facebook and Twitter.